A workshop tool, firmly mounted at a convenient height for holding and gripping material while working on it. Also called a shop, bench, or machinists vice. etc. Parts that fit over the steel jaws of a vise to protect the work. Often copper, aluminium, plywood or timber. A mechanics style vise that has a base that can be swivelled to allow different working positions. Replaceable hardened steel inserts for vise jaws. Used in thousands of workshops, and not just by mechanics of course, but these vises are built to be strong. They should be mounted on a strong bench. Like every other vise, if delicate work is being held then the vise jaws should be packed with a soft material. Timber, copper sheet or aluminium are often used. The vise in the photo in common with most others has a quick release lever (partly hidden by the handle) but it has not got a swivel base. The size of the vise refers to the width of the jaws. For instance the one in the photo is a 150mm or 6". 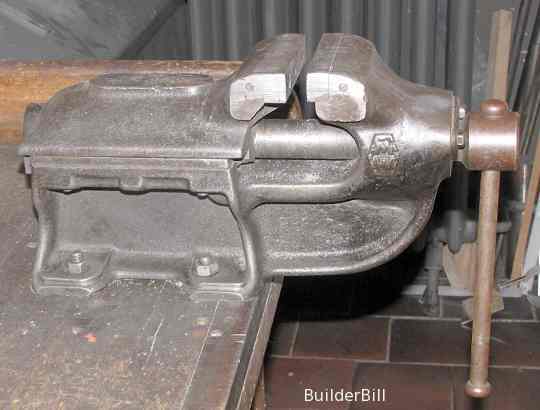 This extremely solid looking vise is in my opinion something of a rarity. Have a look at it and notice that it is the back jaw that is furthest away from the user that moves. 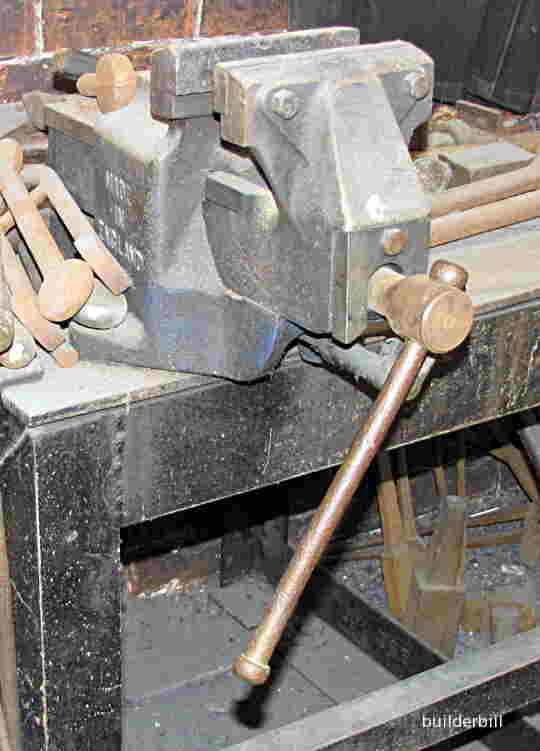 The fact that the front of the vise that overhangs the bench part of the body of it must make it more solid than conventional vises that have the moving part overhanging. Seen at a museum in Munich, Germany.